(Selection of ecstacies recorded in the summer of 1902. 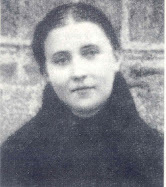 The source for St Gemma's ecstasies is "Estasi-Diario-Autobiografia-Scritti Vari di Santa Gemma Galgani". The following is an explanation of how they were recorded. At times when Gemma would feel that "her head would soon take off" she would hurriedly retire to her room, and close the door. Often noticing her departure, one or more of the Giannini family would go to her room and knock on the door. If she did not reply back, they would open the door and find her thus in ecstasy. They would then grab a pencil and paper and record what was being said. When they noticed her rapture coming to an end, they would then discreetly withdraw. Coming out of her transport a few moments later, she would find herself alone in her room. According to the testimony of Eufemia Giannini, Gemma never once knew that her words while in ecstasy were being recorded. 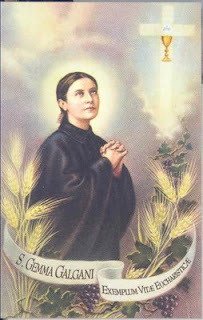 "By the advice and command of Reverend Father Germano, C.P., Gemma's spiritual director, we have been careful to take down, for more than three years, from the lips of' the Servant of God, all she said when rapt in ecstasy. This occurred often, as the holy girl lived in our house, it was not difficult for us to take turns in the performance of our task without her knowledge, the moreso because during these times she was out of her senses. "My God, open Your heart to me. Oh Jesus, open Your sacred breast to me, so I may place all my affections there. And you, oh Jesus, You said many times that You would wel­come me generously: is that true my Jesus? How much I love You, oh Jesus. I thank you; but why do You behave so lovingly while I offend You with such ingratitude? This thought alone should make me become a flame of love, if only I could understand it well ... I love You, oh Jesus. What a fine love is mine, loving someone who does not get angry with those who offend Him ... Oh Jesus, if I were to consider attentively the great cares You show me, how I ought to excel in so many virtues! It's true, yes, I excel, oh Jesus, but in what? ... In sins. Forgive me, oh Jesus, my great negligence; forgive my great ignorance. Oh Jesus, I see You as greater than all the treasures if earth. Yes, my sweetest God, my most lovable Jesus: to my eyes You are greater than the greatest treasures on earth. How gladly I would unite with Your Angels! How gladly I would be consumed in Your praises! How gladly I would remain always before You! Heaven, let me think of you! ... At least when I shall be up there, I shall no longer suffer, I shall no longer endure the sufferings and the pains down here. Oh Heaven! in you there will no longer be nights, nor darkness, nor changes, nor time ... Oh Heaven! in you there will no longer be ... ..Only God of God, light of light, sun of justice, who enlightens; His immaculate heart will give you sunshine ... be­cause consolation is to contemplate God, the king of kings at the center of Heaven. How great! ... What consolation, my soul, to be surrounded by the angels, by his favorites! Everyone's merits are not equal, but each has its happiness. Oh my soul! ... Oh Heaven! ... You will see, when I am with you I shall be satiated, I will no longer have need, not of…… .. But is there such peace in my heart? Is there this tranquility in my soul? No, I do not wish reassurance, I want to live in Your holy fear. Oh Jesus, You are the magnet of all my affections. If Your greatness, oh Jesus, can reach down to the most vile of all creatures such as I, well then help me to repair all the damages I have done with my sins. My Jesus! ... Oh, I am not frightened, because I live under the providence of a Heaven filled with compassion . 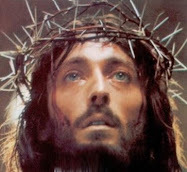 . .
Dear Jesus, I love you so much! ... I shall try always to love you; I shall live to love you ... I shall die to love you. Dear Jesus, Dear Jesus! ...I too, oh Jesus, have a great desire to love You in return! the spirits and souls of all the just; not me, oh Lord. To You all the inhabitants of Heaven, not me ... May they all give You infinite praise and thanks. But me too, me too, oh Jesus. . . Yes, I a vile and unworthy sinner desire to love You, with a unique love. Help me, You who are my strength. Fire, fire in my heart: this morning it's burning! ... Words in my mouth ... May I be able day and night to meditate on Your glory and love You continuously. Impure are my lips, impure my entire body. I need You: that You cleanse me of every stain. Sanctify me, oh Jesus. May Your mem­ory, Your sweetness keep my soul always united with You. Make me pass from the visible to the invisible, from earthly things to the heavenly. Faith teaches me this, the faith You have placed in my heart to illuminate my way ... Grant, oh my God, that whoever knows You, knows truth, knows eternity. You, for as long as I live in this fragile body…. Sunday, June 29, at 10:30am. Who will give me the feathers of an eagle; who will give me the wings of a dove so I may fly to You? ... You should give me, oh Jesus, the wings of contemplation. How am I going to fly to You? So many things to go through! ... Go through all of creation; break these chains that prevent me from flying to You . . . There are many other things, oh Jesus, that nourish my soul when I contemplate them ... but in none of them do I remain satiated, in none do I find repose. Only in You, oh Jesus, only in You does this soul of mine find repose. Lord... my Jesus, when my lips near yours to kiss You, let me feel your gall. When my shoulders rest on yours, let me feel your scourges. When your flesh communicates with mine, let me feel your Passion. When my head nears yours, let me feel your Crown of thorns. When my side touches yours, let me feel the lance. Love that God who loves you so; lift yourself to Him, who has stooped so low for you. Do you not see how vigilant He is? And you, oh my soul, behave like He behaves with you; be spotless ... be pure…Love your Jesus, who has rescued you from such wretchedness . . . Love your God . . . Bless your Lord . . .
Let me embrace You, celestial bridegroom, source of all my consolations. Who am I, to speak so boldly with You? It is true, I am your creature, but I am bad; it's true that I was made by Your hands, and those very hands, oh Jesus, I pierced with nails ... I got going too late, Jesus, in coming to You ... I found You, Jesus; I found You, Jesus. I call You, I invoke You, because I am sure……. Dear Jesus, paradise of charity, wonder of love! I am confused by so many graces, oh Lord, and if You do not help me I shall become ever more ignorant; in the abundance of so many favors, I shall become yet worse and worse . . .
What would I like? I would like, oh Lord, You to assist me ... yes, I would not want to come in such poor condition to receive You. Make me worthy of You, or at least a little more deserving . .
By what means, oh Jesus? ... With the infinite merit of Your most precious Blood! Tell me, oh Jesus, do You find pleasure in being with me? I truly find everything in this. The more I think of You, the more I realize that You are so sweet and lovable! heart of all the Saints, of all the elect, even of my celestial Mother; indeed, I would like that of your Son, to offer them all in Your glory and honor. Beloved Jesus . . . Let's pretend, oh Lord, that you are me and I am Jesus . . . What do you mean, what would I do? I would stop being me, so that You could be, oh God…..
Oh yes, I could do it! ... You see, my Jesus, I have such great confidence in You that even if I saw the gates of Hell open, and I found myself at the edge of the abyss, I would not despair. And even if I saw Heaven and Hell against me, still I would not mistrust Your mercy, because I would put my faith in You. You are so compassionate, so merciful! . . . But by so much graciousness, by so much love, what power would not be con­quered, what willfulness would not be swept away? Rather than let me lack faith and love for You, make me die ... Better to live in suffering than to live as a sinner. . .
And what do You get out of my ingratitude? ... Maybe I am united with You in body, but in heart? ... No, no, my heart is Yours! You see, oh Jesus: You are a strong King, generous, who wages battles and then always wants victories. Allow me the grace to surrender to all Your calls, to love You with the tenderness of affection. My beloved Jesus ... how poor you have become! ... Why do You need me so much? ... And even if You were poor for real, how could I assist You? ... Here it is, oh Lord, my body which is a fistful of dust, and my soul, which instead my Lord makes great . . . Oh my soul!.....My Jesus!....With what love, oh Jesus, can I reciprocate? ... Come on, Jesus, let's leave! Let's go, let's go ... to your Heaven! Oh! but no, no we can not leave just yet, Jesus, no; because I am afraid, I fear ... Did You not say, oh Lord, that Heaven is for those who live in the world, but have no worldly concerns? 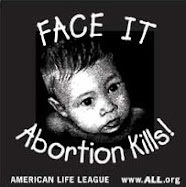 ... Did You not say that Heaven is for the innocents? ... And me? ..
so that with your precious Blood I could be purified …. Yes ... You will do it ... yes! ... I realized that You wanted that prayer, and I took Your strong desire upon myself, to Your advantage ... And because my need is extreme, oh Lord, and the moment is right, I prayed that You to come right away, beloved Jesus. Help me to quicken this desire ... Give me a hand in this task. And when You have made me pure and clean, then yes, I will do everything; I will say my own prayer, and at every hour, at every moment. . .
Stop with your gifts; if not, give me the grace to take pleasure in all of them. Hear me, oh Lord; if not, put a limit on Your generosity…..
soul before Your majesty, which I intend to do right now. My dear Jesus, what confusion this morning! ... You wanted me to turn my mind toward Saint Lawrence, oh Lord, but what did You do? ... To one of your most beloved followers, always in the midst of sufferings, and then I with my ungrateful heart ... I am confused, what with thinking about him in the midst of pain, and then me with the Host enjoying all the sweetness of Heaven. Oh Heart of my Jesus, Heart too sweet! If You wish to give me a similar part, always in the midst if pain, oh Lord, go right ahead; if then You want me to enjoy greater rewards, go right ahead: just be sure that I always come to You with fear of offending You. 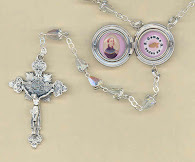 I put together two souls: that of a saint and that of a sinner [St Lawrence and herself -editor]. . . What else but confusion could I find this way? 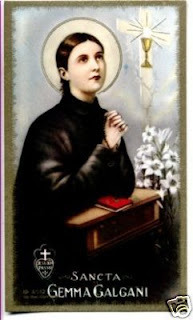 I wanted by means of this same saint to offer myself, because if I did not, I believed I would be negligent in my duty; I am afraid; I am afraid because before You I know my soul to be guilty toward You. I want You to see my soul as beautiful, as Your hands gave it to me. Impossible! ... I no longer can! ... Look, my soul is all bound with chains, and when You gave it to me, it was bound with roses! When You gave it to me, it was resplendent like the sun, and now? See how it is totally deformed! ... Oh! ... It deserves……. And this morning You found in me…..
... My Jesus! ... Yes, my Jesus ... my affectionate Lord! ... Jesus who keeps me bound with such force of love . . . Jesus who loves me, who feels only compassion for my wretchedness ... He is the true Jesus ... You see, my God: if You gave so many graces, so many gifts, so many favors to a soul who could compensate you with a good store of virtues, your kindness would be well compensated, but if You give them the way You give them to me, only in the name of Your mercy…..No, there's no harm in it, oh Lord: what You do is always well done……But at least give me the grace to be able to please You . . .
Oh love, oh infinite love! ... Oh your love I shall never, never be disposessed! ... Oh love! Oh pleasure of love! ... Oh love that so delights me ...that never torments me! Oh love, Your love, oh Jesus ... I shall never share you with anyone! ... This bit of love that I possess, I shall not share even with the Saints in Heaven, nor with earthly creatures. To you, Saints in Heaven, to you, earthly crea­tures, all the virtues; but this bit of love is mine. I want no one ahead if me in the love of Jesus! Oh love, oh infinite love! ... See: Your love, oh Lord, Your love penetrates even to my body, with too much fury. When, when will I unite with You, oh Lord, Who with such force of love keeps me in union here on earth? ... Do it, do it! ... Let me die, and die of love! ... What a beautiful death, oh Lord, to die a victim of love ... a victim for You! But this needs to come from You, if You want me to love You more. Indeed, I should love You with a unique love. Quite interestingly I bought the book on the life of Saint Gemma Galgani on Thursday of this week at our book store at St. Louis Catholic Church located in Pinecrest, Miami, South Florida. I had ordered this book for some time intending to write an article about this unusually young saint to whom the suffering of Our crucified Savior and His sorrowful Mother Mary has been make known to her in very vivid revelations, she herself was made to have the wounds of Christ on her body, after asking Our Lord to let her experience His suffering for our salvation. Only yesterday I told Fr. Peter Damian M. Fehlner, F.I. on the phone that I was reading her biography as told by her Spiritual Director, Venerable Fr. Germanus, C.P. Roy S. Tenn.
You are really going to enjoy Venerable Father Germanus book on the life of Saint Gemma. Since Father Germanus was her spiritual director, he knew Gemma very well. And since he was such an extraordinary spiritual director and was sought after by many people (due to the holiness of this man, the Church has since declared him "Venerable") , he initially did not want to meet Gemma, and was very skeptical and prudent concerning her remarkable mystical graces, but God gave him and extraordinary miracle on the day that he first met her, to show him that God was working in her, and because of that miracle he agreed to become her spiritual director, and thus we now have all the wonderful information that he documented concerning her extraordinary life. Thus, God used this respected holy Priest to prove the authenticity of the extraordinary graces that He was showering upon Gemma. Speaking of this, here is the remarkable account of the miracle that God gave to Venerable Father Germanus on the day that he first met Saint Gemma. Miracle given to Father Germanus to prove to him the holiness of St GemmaI hope you enjoy the book on St Gemma. May God bless you and yours! 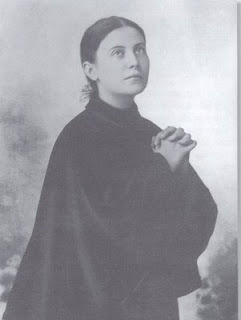 I wish I had been able to know St Gemma. Then maybe I wouldn't be such a miserable sinner, always spending my time doing other earthly things instead of staying close to Jesus in Prayer. I can't even suffer one little pain for Him without crying and complaining.